(Newser) – Time could be running out for Massachusetts prosecutors seeking to put a teenager on trial for encouraging her boyfriend to take his own life by sending him dozens of text messages and telling him to "get back in" a truck filled with carbon monoxide fumes, the AP reports. 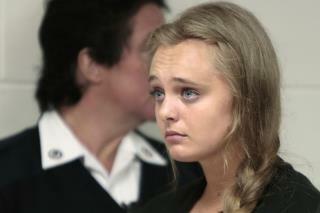 Michelle Carter, 19, is charged with involuntary manslaughter in the 2014 death of Conrad Roy III, 18, of Mattapoisett. Because she was charged as a youthful offender, she could face up to 20 years in prison, the same sentence an adult would if convicted. But Carter's lawyer has asked the state's highest court to either dismiss the manslaughter charge or require prosecutors to try her as a juvenile. If the Supreme Judicial Court agrees to send the case to juvenile court, prosecutors will have only until Aug. 11 to put her on trial. That's the day Carter turns 20, when she will age out of the juvenile system. But she is pretty ..... let her off. I actually did a lot of research on this when it happened. Based on all of the information that I gathered, and my review of both sides, I don't think she should do any time. She was struggling with his depression as well and couldn't handle it anymore. It seems that she really did love him and that she just wanted him to do it, or get help. After the fact, I think she realizes the pain she caused and the poor decisions she made, but he ultimately killed himself, she failed to find the resources to help him. That's my opinion. Did it for the lulz?